Ok, so let me tell you a little about myself. Horses have been a big part of my life since I started learning to ride some twenty-three years ago. I have never been a ‘natural’ rider, taking lots of practice and influential teachers, (my first pony Prince being one of them) to show me the way to where I am now. This has made me the teacher I am today. One thing I have always insisted on, from the very beginning, is that I wanted to work with my horse, to be a partnership. It’s this desire that lead me to Classical Dressage and that first book, Sylvia Loch’s ‘Invisible Rider’. That book caught my attention as I wanted to ride with the quietest of aids and this seemed to be the answer to my question. ‘Invisible Rider’ introduced the concept of the weight aids, exploring this and the reaction from my horses, I was hooked. A good friend of mine booked us the life changing lessons with Sylvia Loch when she was still based on the Scottish Borders. We were inspired. Prazer (Sylvia’s Lusitano stallion) was a true gentleman, giving me my first real taste of true collection, the active effortlessness of movement. It is here when I met my horse Amigo. He was there to be schooled whilst finding a suitable home. I will always remember Sylvia commenting on how we were a pair with our matching hair and this was before we had that fateful lesson together. A few weeks later and Amigo came home with me. The Balance and Bodywork workshop was a revelation, really helping you to become more in tune with yourself and understanding just how subtle the aids needed to be for them to be effective. I was very fortunate that Sylvia was willing to train me to become her first (and currently only) accredited Weight Aids Instructor. Alongside Sylvia Loch, I am also trained by Nuno Cavaco who was a rider from the Portuguese School of Equestrian Art for twenty-five years. His knowledge is invaluable in applying classical principles throughout the training of your horse, always ensuring the horse’s wellbeing is foremost and that we work in harmony with our horses. I am fortunate to work with a variety of breeds, understanding that each horse is an individual and should be worked with accordingly. I will always try to find what works for the individual horse and rider. – a strong, supple horse who takes delight in being ridden by a quiet, empathic yet effective rider. I believe in taking time to build the correct foundations but also to understand your horse better so we can further his education in a positive way through consistent training whether on the ground or in the saddle. I do get asked why I currently don’t compete and it’s purely because I want to dedicate my time to furthering my own development, to training my own horses and rather importantly, to teach. Education and development of skills is so fundamental to me and I feel if I competed, I wouldn’t have enough time for these key factors. 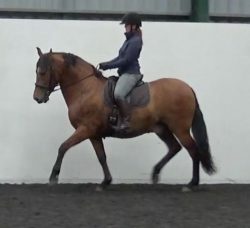 I teach and work with a variety of students from novices to happy hackers to competition higher level dressage riders. The classical principles are available to everyone. I will always do my best to help anyone who needs me. If you do have any questions, please don’t hesitate to contact me. Thank you for reading and I hope you enjoy the rest of my site.